It’s hard work being a giant loveable foam bagel. But goddamn it, someone has to do it. Just ask Charley Radack. “You’re the first person to ever ask about the mascot.” Saul Restrepo, manager of St-Viateur Bagel’s original location, explains while laughing when I ask him about the bagel bakery’s resident massive anthropomorphic bagel head, who, until recently, could be seen doling out high fives and hugs in total smiling silence up and down St. Viateur St. W.
This is how Restrepo describes the longtime bagel bakery. A staple of the Mile End, St-Viateur has been serving bagels 24 hours a day, seven days a week for over 50 years. Established by Polish Holocaust survivor Myer Lewkowicz in 1957, three generations of owners and millions of bagels have come through St-Viateur’s doors. The franchise now boasts six separate locations in Montreal alone. Lewkowicz died in 1994, and was replaced by long time partner Joe Morena, who eventually passed on the bulk of bagel-duties to his three sons, who each oversee various bagel-concerns across Montreal. Almost 60 years after its humble founding, St-Viateur Bagel continues to hold an unabashedly firm grip on the Montreal bagel game. But you knew all that. Everyone knows all that. What isn’t on most people’s minds with the words “St. 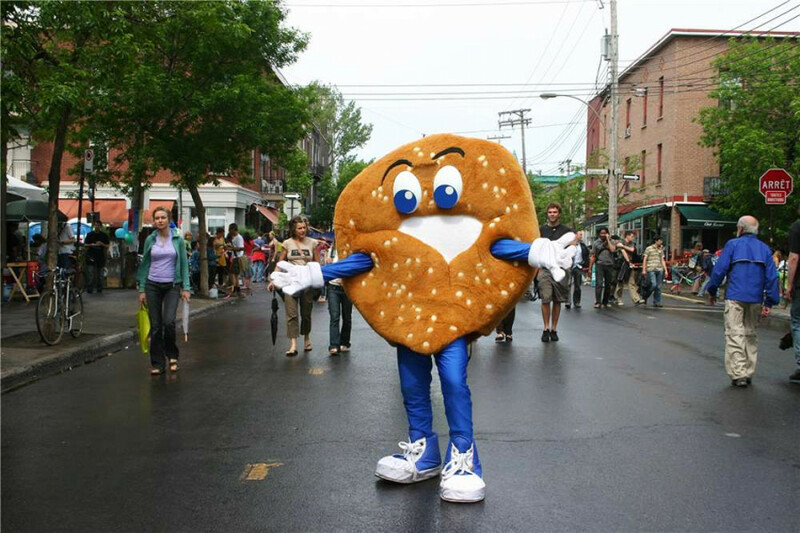 Viateur Bagel” is a huge foam bagel mascot. He is around six feet tall, made of foam, with two huge googly eyes and raised eyebrows, culminating in a permanently surprised expression. His arms and legs, protruding from the sides of his delicious sesame body, are coated in blue spandex and end in comically large white sneakers and two four-finger gloved hands. His name is Sesame. I had heard tales of Sesame, but had never seen him. I knew I had to find the man behind the mysteriously silent, and yet totally enchanting, bagel idol. And so I did. The man inside the semi-disconcerting giant bagel is Charley Radack, 21-year-old native Montrealer and mechanical engineering student at Concordia. He’s also a DJ, the career that magicked him away from his storied history as St-Viateur’s greatest incarnation of Sesame. “It was the summer of 2011, that’s when I started,” Radack said. “It was my first day, a stupid hot day in June, and nobody wanted to be the mascot, so they figured, hey, let’s let the new guy do it. In describing the nature of his work, Radack was all excitement. Though he admitted it’s difficult work, hoisting a “probably 50 pound” suit onto his body to dance and jump around in, he couldn’t recall the experience more happily. Radack quickly shot to the top of the mascotting pole, becoming the go-to man for St-Viateur’s events. However, it wasn’t all roses and high-fiving children. Sometimes, the mascot can really bring out the animal nature in people. In fact, what originally attracted me to this story was the news of Radack/Sesame being attacked by teenage ruffians in a park. The costume is, strategically speaking, totally defense-incapable—a giant weighted disk that only allows the wearer’s arms to extend straight out to the forearm, and absolutely zilch in elbow-bending capabilities. A harrowing circumstance indeed. Radack also spoke of being pushed by excited strangers, even dry-humped by groups of fundraiser attendees. Despite these isolated incidents, however, Radack doesn’t think it’s the fault of the costume, so much as the performer. “To a degree, yeah [it brings out the animal in people], but I get the people going too, I kind of feed it. I jump around, shake my hands. It’s kind of 50/50, but I definitely feed it,” he explained. 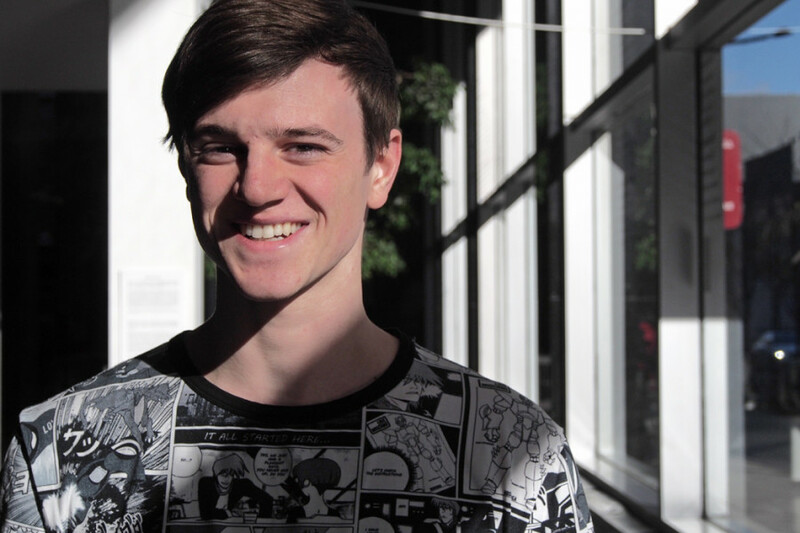 Radack has since moved on from Sesame, now a full-time student and DJ, but he looks back positively on his time as St-Viateur’s greatest mascot. He expressed adamantly that if ever the owners were to call and ask for him to suit up one last time, he’d be back as Sesame, no questions asked.